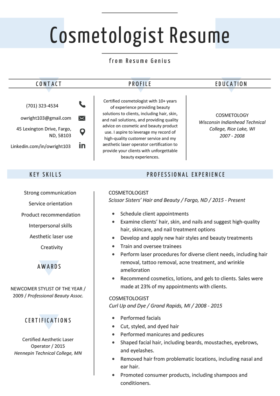 Stay a cut above the rest with our downloadable hair stylist resume, and brush up your application with these expert writing tips. Licensed Cosmetologist with over 6 years of experience providing customers with a full range of hair care services, building a strong client base and performing administrative duties. Aiming to use my proven customer service, sales, and communication skills to effectively fill the hair stylist position in your company. Provide 6+ technical hair services, including, but not limited to straightening, coloring, balayage, foiling, special occasion hair, and cutting. Analyze hair and scalp condition while providing basic treatment or advice on beauty care treatments for scalp and hair. Restock workstations and inform management of necessary inventory in need of replacement. Cross-sell multiple brands and beauty categories (makeup, skin care, hair, etc.) resulting in a 10% monthly sales increase. Adhere to Club Hair’s standards for excellence in customer service and cleanliness. Shampooed and blow-dried hair in addition to providing other hair treatments, such as waving, straightening, tinting and scalp conditioning massages. Managed the appointment book and online booking of over 150 clients. Upheld the standards of sanitation and sterilization as directed by law as well as the spa’s policies and procedures. Suggested hair care products to customers with a service-to-sales ratio of 20%. The job outlook for cosmetologists is sitting around 13% and on pace with the national average. A hair stylist’s salary largely depends on the state they work in and their level of experience. Hair dressers can make anywhere between $16,000 (entry-level) to $43,000 (experienced). Based on the number of opportunities, Washington D.C., New York, Texas, California, and Florida are the best places for new stylists to find a job. The most lucrative hair stylist opportunities are given to those with a vast knowledge of haircare services. Being a professional hair dresser requires you to keep up with continually changing fashion trends and styles. Customer service skills are also an absolute necessity in order to survive within the field of cosmetology. The best hair stylists are able to use their customer service abilities to build up a loyal customer base over time. Loyal clientele is every stylists dream as it is highly valued by salons and results in a consistent stream of business. However, before you can build up a list of clients, you’ll have to start out at the bottom of the totem pole like everyone else. Finding a position at the right spa or salon is key to getting your career started off on the right track. To get the interest of the hottest salons in your area, you’ll need a hair stylist resume that is properly shampooed and blow-dried. The most important piece of information that hiring managers want to know is whether or not you have a license to practice cosmetology in your state. Without a state license, it is illegal to practice any form of cosmetology. If you are caught, you will face harsh fines or even criminal charges. Each state has their own specific requirements, but the average amount of hours you can expect to spend is between 1,500-2,100. The process usually consists of attending a certified school, hands-on training, and passing a state exam. Each state has their own unique process, and may substitute taking classes with an apprenticeship. It’s important that you do your research, so that you are aware of all the necessary requirements. Another qualification you will see on most hair stylist job postings is the ability to lift and carry anywhere between 25-50lbs. This requirement pertains to stocking and merchandising the salon or spa, which is an administrative job duty for hair stylists. 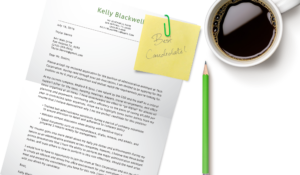 Properly conveying your skills and abilities on your resume is essential for landing the job—learn more here. To maximize your odds of getting an interview you must customize your resume to each position you apply for. Not every company requires the same amount of experience and skills—a hair stylist at one company may not have to perform the same tasks at another. Spend a few minutes picking apart each job description to find exactly what the employer is looking for in a candidate. This is a great way to help you decide what to include in your own professional experience section. Provide 6+ technical haircare services, including, but not limited to straightening, coloring, balayage, foiling, special occasion hair, and cutting. Notice how the sample’s point uses a similar format to that of the employer’s. The job candidate does not simply copy the job description, but instead includes their own relevant haircare techniques. As you can see here, the candidate doesn’t use the same format, but still addresses the employer’s need for someone who can “promote product sales.” The applicant does this by quantifying their bullet point with a measurable statistic (increased sales by 10%). Adding a statistic is always more effective than merely saying “increased sales.” The more you tailor your resume to the job description with quantified stats sprinkled through, the more likely you are to gain the attention of the hiring manager. There’s plenty more where that came from. We’ve got all the resume verbs you need with the longest action verb list in the universe. The key to an effective hair stylist resume is being able to show off the full range of your talents, while at the same time meeting the needs of a specific employer. If you can do both, your resume will have salons begging for your haircare expertise. 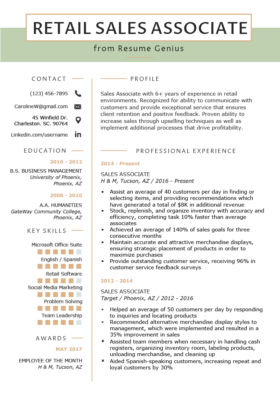 Make sure check out our blog to keep up with all the latest resume trends.